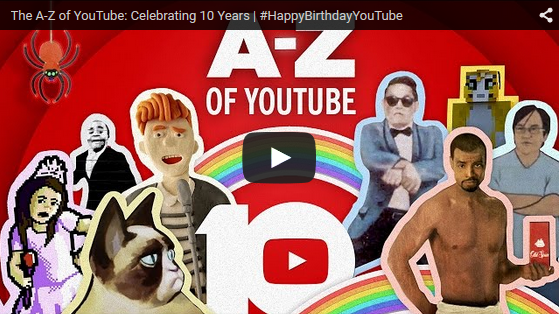 Happy 10 Year Birthday, YouTube! Ten years ago, YouTube’s journey began with a simple 19-second video of an elephant at the zoo. Who could have predicted that the new platform would become a global phenomenon? And now, today, it is a ubiquitous part of everyone’s online cruising patterns. Viewers are from around the world and are all ages. YouTube has also given us new forms of communication (vloggers), new art forms (memes), and of course, new music stars (such as Justin Beiber), sports, news, celebs only found on YouTube, plus millions of cat videos! Can you even remember what you did for entertainment before YouTube? Poll students about their YouTube viewing habits. Do students remember the first time they watched a video on YouTube? What was it? Divide students into teams. Have them compile a list of favored videos from companies, celebrities, products, musicians, and more. What makes these video favorites?